An error boundary is a React component with a componentDidCatch(err, info) method. Any errors occurring in a component tree get reported up to the nearest error boundary’s componentDidCatch function. Note that error boundaries only catch errors in the components below them in the tree. For simple apps, you can declare an error boundary component once and use it for your whole application. For more complex applications with multiple components, you can have independent error boundaries to gracefully recover each part. You can also report these errors to an error monitoring service like Rollbar. This will give you the ability to track how many users are affected by errors, find what caused them, and ultimately improve your user experience. We’ll show you a working example of how to do this at the end. Create a component class that extends a React Component and passes the props. Add your new component in HTML, surrounding the parts you would like to include in your error boundary. In this example, we are adding an error boundary around a buggy counter component. 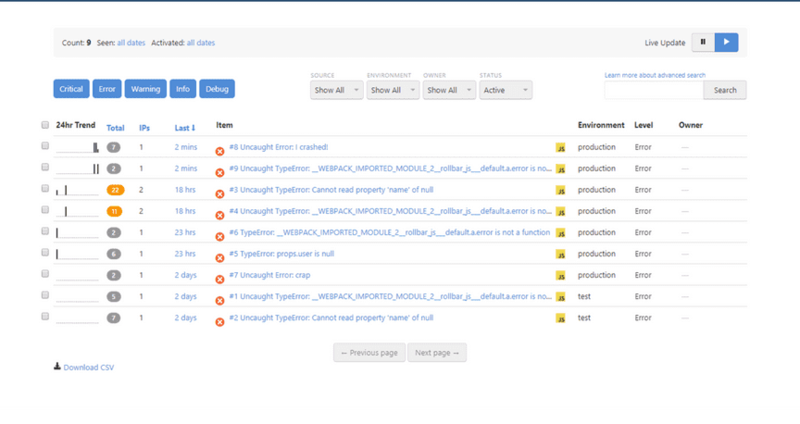 For real-world production applications, it’s important to monitor errors so you understand your user’s experience. If your application is breaking, you don’t want to lose customers or have them complain on app reviews or social media. It’s much better to monitor those production errors so that you’re the first to know, and can fix the issue before more customers are impacted. 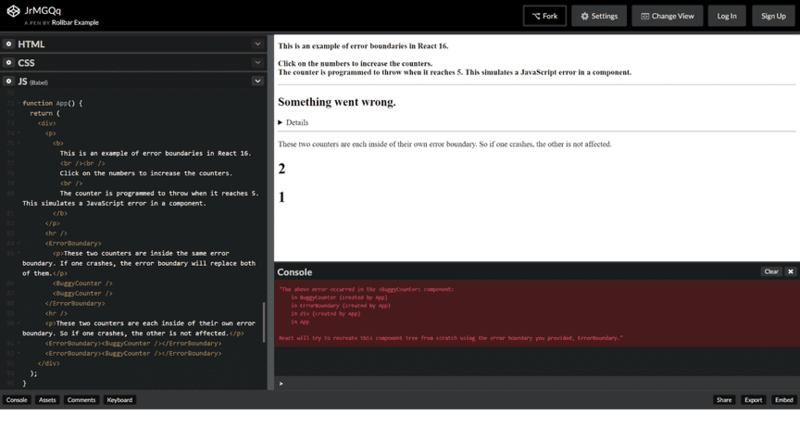 Open our previous Codepen example which has error boundaries configured. Add Rollbar error tracking to the error boundary’s componentDidCatch method. Rollbar.error(error); // Send it to Rollbar! Load the page and trigger the error by clicking 5 times. Then, see what these errors look like in our public demo account’s Items page. You don’t need to sign up since this account is open to everyone. 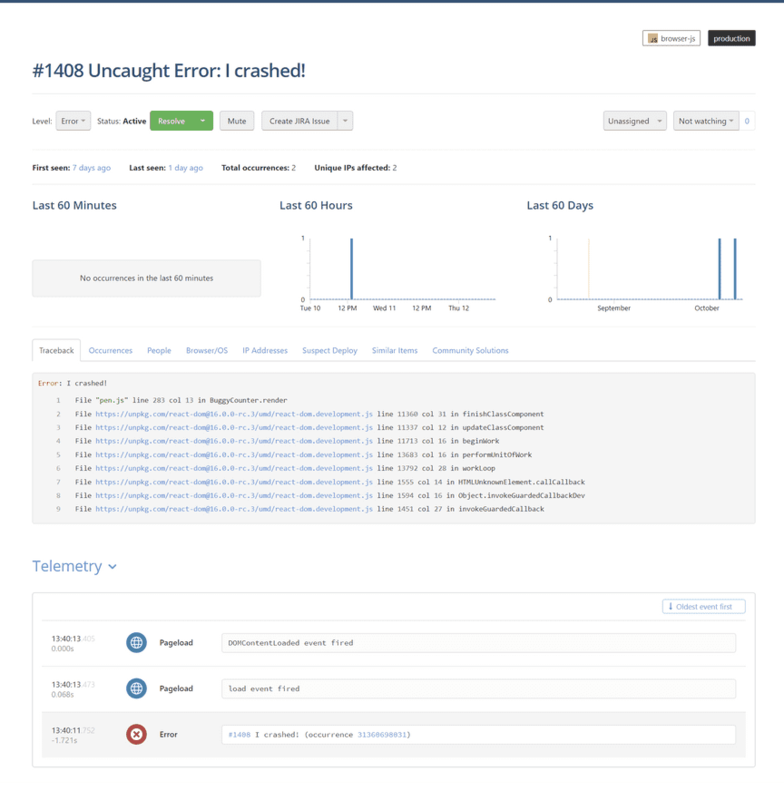 Get more details by clicking on the item near the top of the list that says “Uncaught Error: I crashed!” You can now see a traceback and telemetry recording what happened before the error occurred. This provides more context to help you find the root cause of errors. We highly recommend you add error boundaries to your React applications. They are very easy to use, and not only help you provide a graceful recovery, but also report those errors to Rollbar so you can quickly fix errors before they impact more users.